We’ve developed a plan for Campsie that improves the town centre with new shops, jobs and homes and improved pedestrian and cycle links. Have your say. The station precincts are already great places to live, and each has its own unique qualities. This Strategy will enhance the precincts by: valuing neighbourhood character, renewing town centres, providing improved open spaces and community services and facilities. Campsie was announced as a Planned Precinct by the NSW Government as part of a housing affordability package on 1 June 2017. Planning for these Precincts is coordinated by state and local governments, to help ensure infrastructure such as schools, parks, community facilities, public transport and road upgrades is delivered to support community needs. Promote growth to reinvigorate the centre and support the role of Campsie as a District Centre within the Sydney South District. Future development is designed well and positively contributes to the public domain. Beamish Street will be supported and benefit streetscape improvements. New opportunities for open space and community facilities to support the growing population. Anzac and Carrington Squares are protected as part of the future growth of Campsie Station Precinct. Enhance connections between Campsie District Centre and the Cooks River. 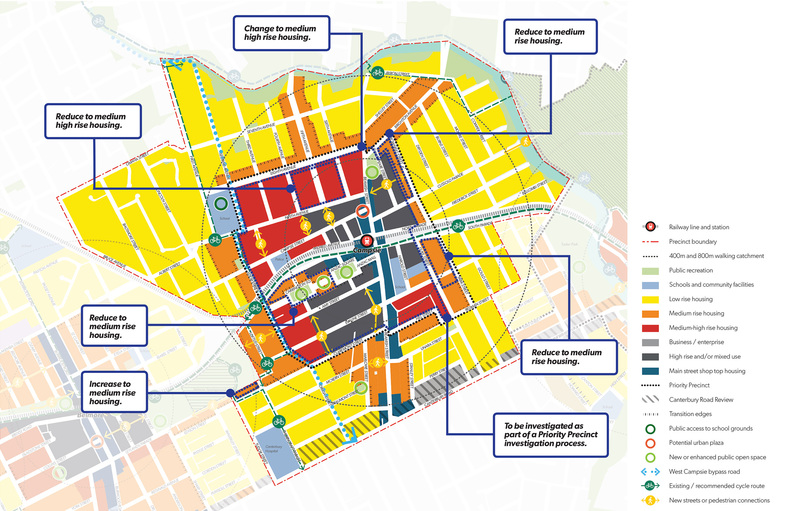 This map shows the key changes that have been made to the Campsie Station Precinct Plan as a result of your feedback. Public Domain and Station Access Plan Sydney Metro will prepare a Public Domain and Station Access Plan for improved station design, accessibility and interchange with other modes of transport. The new metro station at Campsie will provide improved pedestrian and bicycle access. West Campsie Bypass DP&E and City of Canterbury Bankstown are exploring funding options for a west Campsie bypass to manage traffic congestion. Priority Precinct Rezoning Campsie Station Precinct has been identified as a Priority Precinct. DP&E will work with Council to prepare a master plan to support rezoning of the area. We will use community feedback to produce the final Strategy. Once finalised, we will continue to work with stakeholders to deliver the Strategy and plans over the coming years including master planning and rezoning of Campsie. New, improved and connected cycleways, walkable neighbourhoods increased parks and open space are important to you. Traffic congestion needs to be addressed, particularly on Wonga Street, Evaline Street, Ninth Avenue, Beamish Street and Brighton Avenue. Public transport options in Campsie need to be improved. Strong design principles and sustainable building controls need to guide new development. More detailed information on your feedback can be found in the Campsie Station Precinct Plan.